There is no doubt that the results of this week’s presidential election will have ripple effects throughout the energy business. The casual observer may conclude that President-elect Trump will be great for energy companies and their projects! The more nuanced, thoughtful veteran – especially those charged with executing an energy project – will ponder what the future holds. The president-elect is just one part of a complicated public perception, political, and policy puzzle affecting energy projects across the country. 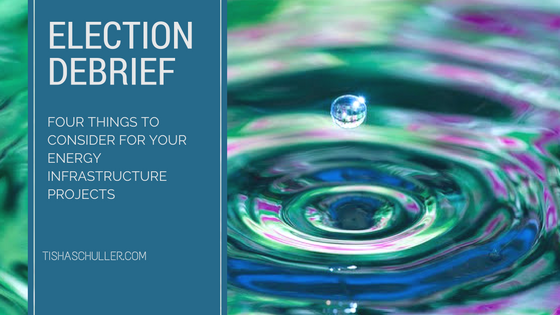 From new drilling to pipeline replacement, you and your project teams should be thinking about these ripple effects right now. That’s how you will stay ahead of whatever waves, from tsunamis to ripples, may be coming your way. 1. Be alert for new proxy battlegrounds. Technically, the presidential election will only directly affect federal agencies and federal lands. But no one knows how this divisive election will mobilize foot soldiers. Oil and gas drilling in one community could become a proxy battle for “locals vs corporations”. Pipeline expansion in another could become a proxy for “climate vs big oil”. I recommend keeping an eye out for new developments, particularly when they attract uncommon allies. Watch, for example, the Dakota Pipeline controversy. Will it become an even larger symbolic battle for climate, land, and sovereignty issues? Will it attract new players to both sides, taking on outsized importance as a symbolic rehash of election issues? I expect that populists of both political stripes may join protests against companies. Traditional alliances have broken down and the results remain unknown. 2. Consider your project’s public interface. It’s worth taking a quick survey of all of the elements of your project that have a legislative, regulatory, or other public-engagement component. Hearings, public comment periods, and regulatory approvals all introduce risk into your project. Take a few moments to map out these processes and ponder who, if anyone, might want to have a say in your project. That say may be symbolic – to make a point – or practically, to register their recommendations, concerns, or support for the project. Your project is not happening in a vacuum; it is part of a complicated and uncertain political and social landscape. Thinking about the stakeholders, friendly and potentially hostile, that might want to use your project to their ends, is wise, and will allow you to inoculate against and appropriately manage new risks. 3. Be a good neighbor. All energy development projects are now happening within a paradigm of shifting public expectations. Taking stock of how stakeholders may perceive your project, and how your project promotes or threatens their interests, will prepare you for what is to come. Although political issues are broadly framed in a world or national context, nearly all interaction with both supporters and opponents will occur locally. Certainly, all constructive, proactive engagement on behalf of your project will happen within the community. Civic leaders, local elected officials, community organizations, areas businesses, and project neighbors will benefit from understanding your project, and your project will be better for getting to know them. Certainly, you want to get to know them before they rally against you, or you need them. 4. Model civic leadership. I had to turn off my social media feed today because everywhere I turned, partisans were doubling-down on their divisive positions. That’s easy to do when you are a pundit, or a participant in the peanut gallery. People who need to build the energy infrastructure projects that keep our economy functioning do not have that luxury! We can do more than close our eyes and cover our ears to the unproductive political grandstanding. Energy companies and project developers can lead, overcoming controversy, complexity, and confusion with clear, thoughtful, and compassionate engagement. Each of us can double-down on our commitment to the miracle of democracy, the wonders of capitalism, and the contribution we make to an energy infrastructure that is so high functioning, that our society takes it completely for granted. We can use our projects to chart a positive, proactive, engaged relationship with our communities. We don’t know what storms will generate waves that can affect energy infrastructure projects. Some will be helpful and facilitate project development, others can undermine the viability of project execution. Stepping back from the logistics of project development to contemplate the opportunities and risks presented by presidential election, will allow each of us to participate positively in whatever the future brings.